With all the great and at least slightly tragic musical figures who have earned the biopic treatment who could be next? Who could follow such deserving figures as Ray Charles, Johnny Cash, Al Jolson, Jim Morrison, Ian Dury, Glen Miller, Gene Krupa, Edith Piaf, Bob Dylan, Serge Gainsbourg, and, of course, Dewey Cox? 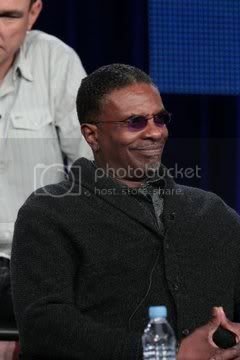 Marvin Gaye? Jacques Brel? Joni Mitchell? Jimi Hendrix, for crying out loud? Nope, why make just another flick about a genius who forever changed the face of contemporary music when you give the world the world story of the man without whom there would be no “Der Kommisar” and or “Rock Me, Amadeus.” Ladies and gentlemen, direct from Austria and the year 2008 — sometimes it takes a while for good things to make it stateside — I present “Falco – Verdammt, wir leben noch!” (“Falco – Damn, We’re Still Alive”). Forgive the lack of subtitles, but I’m feeling like we get the gist. H/t to Christopher Stipp of /Film. Okay, it should be mentioned that Falco was, in fact, the most famous German language pop artist internationally, at least that I can think of right now. Also, I sort of liked “Der Kommisar” back in the day. “Rock Me, Amadeus” never did it for (for that matter, neither did “Amadeus”). Also, I believe that my first ever paying writing assignment was writing a review of the worldwide-hit free album Herr Falco made betweeen “Der Kommisar” and “Rock Me Amadeus.” If memory serves, I think I gave it a C+ or, perhaps feeling a bit generous, a B-. Shades of things to come. Special bonus video after the flip. Tags: Al Jolson, Bob Dylan, De Kommisar, Dewey Cox, Edith Piaf, Falco, Falco - Verdammt, Falco trailer, Gene Krupa, Glen Miller, Ian Dury, Jim Morrison, Johnny Cash, Ray Charles, Rock Me Amadeus, Serge Gainsbourg, wir leben noch trailer, wir leben noch! Today is the thirtieth anniversary of the murder of John Lennon. It was a bummer at the time and it’s depressing even now. In any case, it’s an opportune time to present a clip of Lennon and his little back-up band performing one of his most underrated songs. Keeping up my Bob Dylan theme from yesterday, it’s worth noting that this was famously Lennon’s effort at writing a Dylan song. Of course, it came out a Lennon song, but that’s kind of the point. Also, I never fail to marvel at how well these musical sequences from 1965’s “Help” — a movie that on the whole didn’t hang together at all well — were shot by the great director, Richard Lester. It’s a just about perfect sequence in my view. Coincidentally, MUBI pointed the way to this Look Magazine interview from the set of Lennon’s one and only solo starring role, also with Lester, “How I Won the War” from 1967. It was obviously hot on the heels of the “bigger than Jesus” craziness, so there’s the inevitable discussion of religion and spirituality. Perhaps Leonard Gross thought he was just penning the usual cliches we writers write about controversial and talented creators when he wrote the following. Still, his wrap-up turned out to be a lot more right than he probably realized. The hysteria that surrounds him can no longer disguise the presence of a mind. His ideas are still rough, but his instincts are good and his talent, extraordinary. You may love him, you may loath him, but this you should know: As performer, composer, writer or talker, he’ll be around for a long, long time. To the world at large, Robert Carlyle is best known for his roles in “The Full Monty” and “Trainspotting,” though James Bond aficionados likely remember him more fondly for his villainous turn as Renard in “The World Is Not Enough.” Since 2009, however, sci-fi buffs have been thrilling to Carlyle’s work on “Stargate Universe,” where he plays the ever-scheming Dr. Nicholas Rush. Premium Hollywood had a chance to chat with Carlyle just as the series returns for its second season, and in addition to offering up a few ideas of what we can expect to see from Rush in the near future, he discussed his opportunity to direct an “SGU” episode, which actor on the show he’d like to work with more often, and what led him to venture away from motion pictures and take this gig in the first place. Premium Hollywood: Hello, Robert, how are you? Robert Carlyle: Very well, thanks. PH: It’s good to speak with you again. 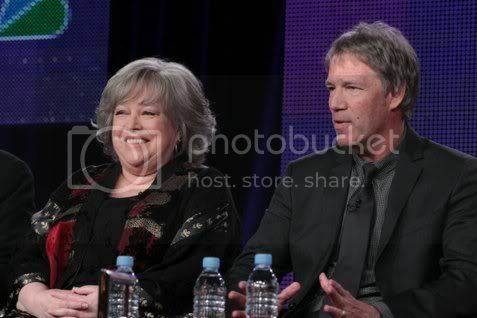 You and I chatted briefly a few years ago when you were at the TCA tour. 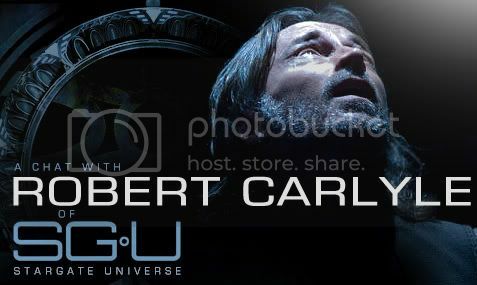 PH: Well, you’ve been talking up Season 2 of “Stargate Universe” since Comic-Con in late July. You’ve got to be glad it’s finally here! PH: I’ve read some of the reports about your panel there. It sounded like you guys had a good time. RC: Yes, absolutely! But, I mean, I enjoy everything about this. I really, really do love everything about this job. There’s nothing at all that’s upset me so far, or else I’d be gone. I wouldn’t be here. (Laughs) I’d be off doing something else. But this is all good . PH: Do you enjoy the Comic-Con experience?